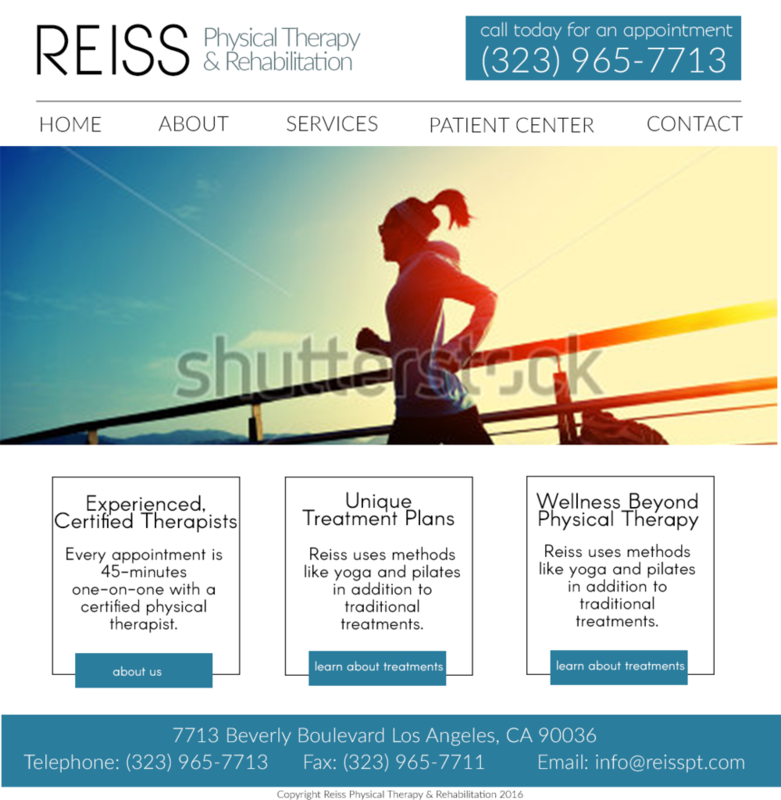 Reiss Physical Therapy is a small physical therapy clinic in downtown Los Angeles. They have an excellent reputation in the local community for providing excellent physical therapy with innovative techniques. I was tasked with redesigning the RPT website with a focus on providing an easy way for patients to access information and contact the clinic. I spoke to the staff about what they wanted from the website and come away with a number of concrete goals, style ideas, and content needs. I researched the websites that the client indicated as competitors, as well as the websites of about 10-15 other Los Angeles area physical therapy clinics. 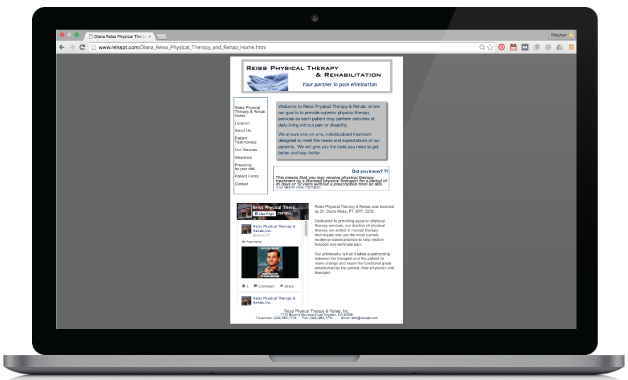 This gave me a better idea of the typical content on a physical therapy clinic website as well as what the most important information might be so that Reiss’s website could stay current with the field but still stand out. I especially took note of the different menu structures and what information was featured on the landing pages. I analyzed the content of the site and its pages, taking note of redundancy and points of potential consolidation. Using the information gathered from my interview with the clients, I constructed some user personas of typical Reiss Physical Therapy patients. I also spoke to a physical therapist about why people often go to physical therapy. I analyzed Reiss’s website menu and considered what would be the most important menu items to keep on the page. I thought that several of the current pages could be consolidated under a “Patient Corner” section, which I had seen on a number of competitor websites. I sketched a number of wireframes for both web and mobile – for mobile, I focused more on contact information, since many people were likely to access the site on their phones to need to contact or find the clinic. I asked several people who fit the Reiss’s typical patient description to look at the old site and the new site and try to accomplish the goals set by the client. Ideally, I would have used actual Reiss patients, but the long-distance nature of the assignment prevented me from doing so. In terms of navigation, users seemed more confident guessing where to find staff information and less confident about finding forms. Users more quickly identified contact information and services - they were on both versions of the menu, but were now easier to find since there were fewer options. I experimented with designs of several of my wireframes visually before settling on a final version. I spoke to the Reiss Physical Therapy staff about what they wanted from the website and come away with a number of concrete goals, style ideas, and content needs to ultimately create this design. The site is currently being developed on SquareSpace, in order to allow the client to easily alter content as needed. One of the biggest challenges of this project was the physical distance between me and the client. I would have loved to be on-site and see their practice first-hand and speak to some of their patients, with their permission. This prevented me from doing any in-person testing before the site goes live. I may be in Los Angeles later this year, however, and am hoping to stop by and see what patients think of the site. Another challenge was that I didn’t know very much about physical therapy. I had to ask for additional information to understand the difference between techniques or treatments or just a special kind of program that was offered.